William Hayes isn’t just going to help the homeless; he’s going to become homeless. 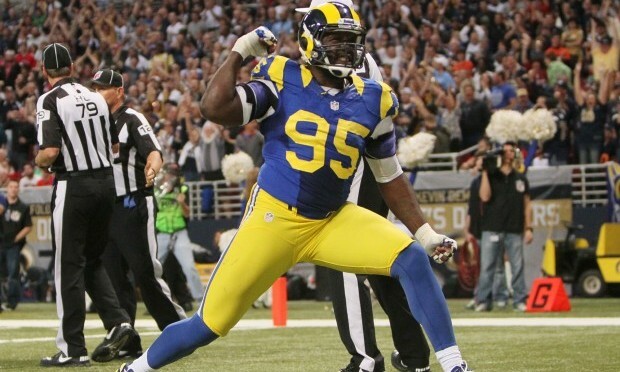 Hayes, the St. Louis Rams’ defensive end, has dedicated 2014 and into 2015 as a year(s) of service to the homeless community. It began last spring with a paintball event to raise money and it will climax at the end of March when he spends three days on the streets. Over the course of seven months, Hayes has, or will, take part in at least one event that will expose him to different issues in the homeless community and what the homeless face. His hope is through all of this he can not only help those in need, but bring awareness to the issue of homelessness in St. Louis and around the country. “I guess it started about two years ago when I did an event with (his teammate) Chris Long around Christmas,” Hayes said. “When we saw how the kids were living, how the families were living it just gave me a whole new perspective on life. June, 2014: The paintable fundraiser with other members of the Rams. “That was a lot of fun and it helped us get started with the project,” Hayes said. “You listen to a lot of these kids’ stories, and you just want to help them. August, 2014: Back to School giveaway in which he helped students, in need, get the school year off in a good way. “When you see what these kids don’t have, what they need, it hits you,” Hayes said. September, 2014: A day of gardening at City Seeds Urban Farm where he wired with several local organizations to harvest, produce and distribute affordable, healthy, locally grown produce at the 2.5 acre farm near St. Patrick Center. City Seeds is an urban agriculture partnership with St. Patrick Center that provides job training and therapeutic horticulture to individuals who are homeless and underserved. October, 2014: Another paintball event. November, 2014: Holiday giving to homeless veterans; and a lunch of thanks. Hayes will meet with homeless veterans for lunch at a local establishment in St. Louis, McMurphy’s Grill. December, 2014: Hayes will help a once homeless family move into their new home and get it ready for the holidays just in time for Christmas. February, 2015: Activity Day at the Rosati Group Home. Rosati provides counseling, daily living skill instructions and 24-hour care to clients struggling with mental illness. March, 2015: A day with Mobile Outreach. Hayes will spend the day with counselors, who go out into the community to develop relationships with the chronically homeless, who are in need of services. Then it ends when Hayes will spend three days homeless. As a football player Hayes has done well. He was a fourth-round draft pick out of Winston-Salem by the Tennessee Titans in 2008. After four years with the Titans, he followed head coach Jeff Fisher to St. Louis in 2012 where he set a career-high with seven sacks. Last year he signed a new three-year, $10.5 million deal with the Rams and has been a starter throughout the 2014 season. What he has done on the field pales in comparison to what he’s doing for the homeless community in St. Louis. “Any time I can bring a smile to someone’s face, I enjoy that,” Hayes said. “I’ll take helping all these kids over winning a Super Bowl. It means more to me.